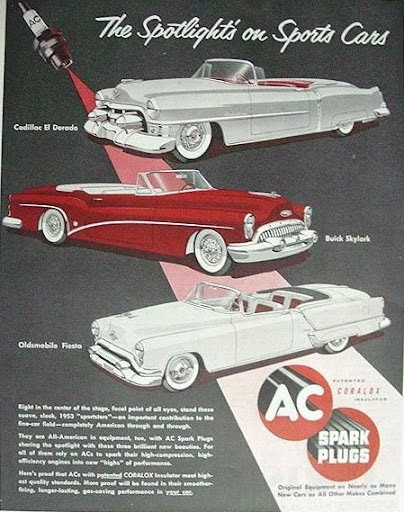 I’ve mentioned before that I think 1953 was the ultimate year in General Motors history. Never mind that it was twenty years before I was even born. The products, legacy, and accomplishments from that year speak for themselves. But you can’t really get the full impact of just what GM was able to produce just by reading things. 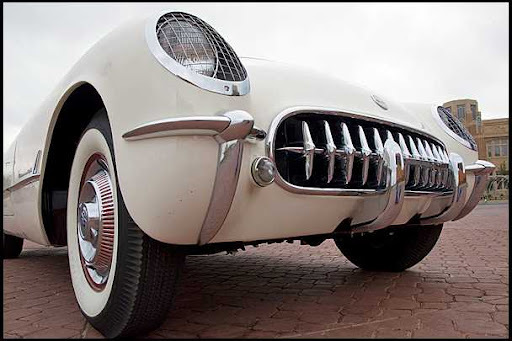 You really need to experience the crown jewels of the 1953 GM lineup firsthand. The Mecum Spring Classic Auction in Indianapolis is providing a rare, rare opportunity to do just that. Crossing the block will be the ultimate quartet of GM’s most ambitious and sought-after cars; a 1953 Chevrolet Corvette, a 1953 Cadillac Eldorado, a 1953 Buick Skylark, and a 1953 Oldsmobile Fiesta. These are not the run-of-the-mill 1950s barges that you see at every car cruise in town. Every one of these cars was extraordinarily special. They were exclusive, extremely limited-production, hand-built symbols of success. They weren’t sold to make money for GM, per se, they were offered to prove to the world that GM could build whatever they wanted, as lavishly as they wanted, cost be damned. 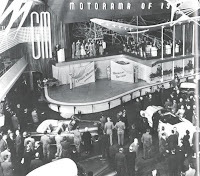 You are probably aware of the GM Motorama car shows that toured the U.S. in the 1950s. Opulent displays showcased chrome-drenched production offerings from every GM division, but also featured one-off “dream cars” that offered real and imagined glimpses into the automotive future. 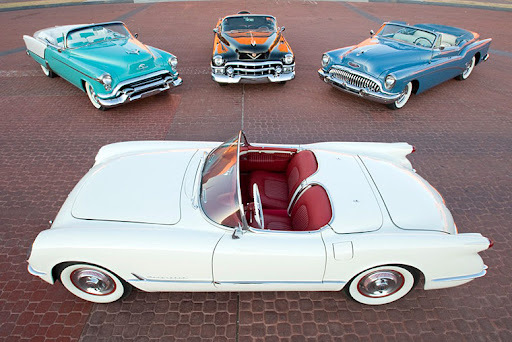 But in 1953, these four vehicles were not only designed and built like said “dream cars.” If you had enough money, GM would actually sell you one. Details like cut-down body panels, full, hand-stitched leather interiors, low windshields, and razor-thin, finely detailed chrome trim set these cars apart from the one the next door neighbor may have owned. Let’s look at the 1953 Eldorado. It sold for nearly double that of a regular Cadillac. It was out of reach for anyone but the very rich. And only 532 of the custom-bodied beauties were built all year. 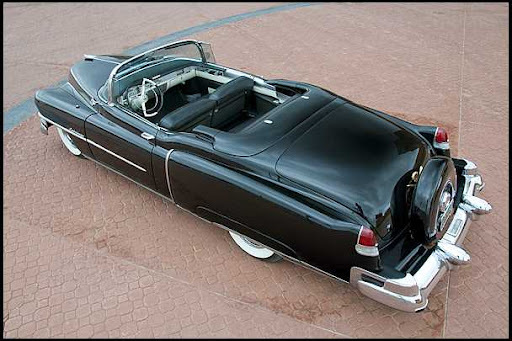 The one Mecum is offering is a rare black on black and white leather example with four sparkling Kelsey-Hayes real Cadillac wire wheels on the ground, and one more makes five in the continental kit. Or take the ’53 Oldsmobile Fiesta. 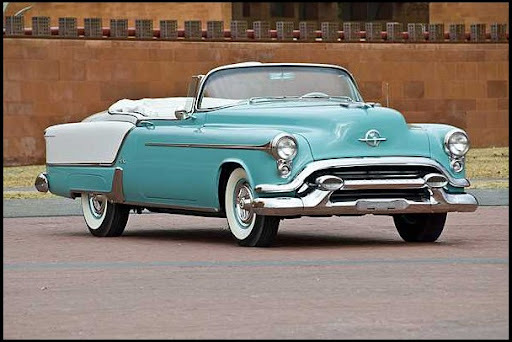 Oldsmobile built 334,462 cars in 1953. Only 458 of these were Fiestas. It looked more-or-less like a regular 98 convertible, but none of the body panels were interchangeable, and it cost more than double. The ’53 Fiesta is a great example of wretched excess, and it is spectacular. This example at Mecum is finished in a gorgeous Regal Turquoise and Royal White color combination. Mecum claims that is as original, which I don’t doubt, but it is so rare that I’ve never seen one like it before. Usually (and I say that tongue-and-cheek, because there’s nothing “usual” about one of these) if you see a Fiesta with any turquoise, the scheme is reversed, so the front is white and the rear is turquoise. 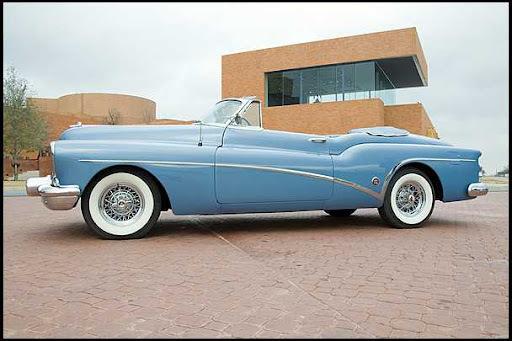 Buick got its own ridiculously awesome custom car in ‘53. This one had the highest production totals—a whopping 1,690 copies. Gleaming Kelsey-Hayes genuine wire wheels, acres of waffle-patterned leather, and a special custom body made this Buick more expensive than a Cadillac Deville convertible. The car they are selling at Mecum looks just as nice as it possibly can in the pictures. The color is Light Patriot Blue, which is pretty, but not a personal favorite in comparison to some of the other offerings on the pallet. Still, how often do you see something like this—especially in the same place as these other cars? Even value-leader Chevrolet wasn’t left out. And at the time, their car was probably the most radical of them all. Instead of the practical, sensible, entry-level family haulers they were known for, Chevy got the Corvette—an impossibly low, two-seat fiberglass roadster that didn’t even have roll-up windows. The Corvette was pulled straight from the Motorama circuit, and only 300 were made in that groundbreaking year. The freshly-restored example that Mecum is offering for sale at Indy is the 274th built. Think about that. It wasn’t just the 274th built that year. It was the 274th production Corvette ever built. Heck, it is so rare and valuable that if I were a rich guy and went to the auction and bought it, I think I’d be too afraid to drive it. All four of these cars are being offered by one unnamed collector. This isn’t unprecedented in Mecum history, as a Skylark, Eldorado, and Fiesta, all red, plus the only 1953 Skylark hardtop, were offered at the 2009 Kissimmee, Fla. event. 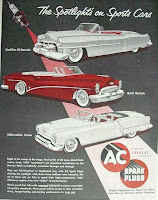 These cars were part of the famous Bob McDorman collection. The Indy Spring Classic has been one of Mecum’s premiere events for the past 24 years. These four cars alone would make it worth the trip, but there will also be significant rides like the 1963 Shelby Cobra that Carroll Shelby used as a demonstrator, a 1957 Thunderbird that was originally built for NASCAR racing, and several rare muscle cars from the Paul Dehnert estate. This event will be held at the Indiana State Fairgrounds on May 17-22, 2011. Or, if you can’t make it, much of the auction will be shown live on the Discovery Channel’s HD Theatre. For information on hotels, tickets, consigning a vehicle, or a full list of the cars and trucks that will be offered for sale, check out this link.